where the fateful Dyer Expedition of 1930-1931 began. Concerto for Orchestra After Lovecraft. page four of the full score is on the architect's desk. Behind me you can see about two thirds of one of my paintings. It is in oil on canvas, 21" by 36," was painted sometime around 1979, and is entitled THE CITY. A MIRACLE OF RARE DEVICE. AT THE MOUNTAINS OF MADNESS was composed between 1983 and 1984 and published as an on-demand score in 1985. I revised it in 2011 through 2014, while engaged in many other projects. The new score was uploaded on January 11, 2013. The new version is exactly the same length, down to the last sixteenth note, as the first. The revisions were extensive, but almost all of detail. The work was first inspired by a single word that came to my attention. I learned of the William Gaddis novel The Recognitions at about the same time I read a card file in the library of a dissertation about "Recognition and Re-Cognition" in music. I have never read the latter work; I finally got around to reading the former only relatively recently. 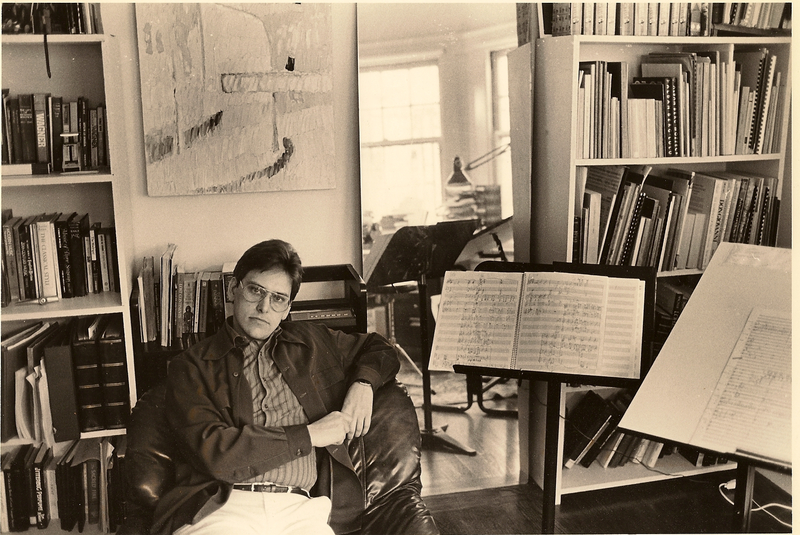 The notion of the recognition of a musical idea was of course not new, but I am not a composer who insists on the use of recognizable material. Sometimes I use recognizable motives, even themes; sometimes I do not. I became very attracted however to the idea of creating a kind of music in which the ideas were of varying degrees of recognizability. Some would be readily recognizable, some less so; as I began to think about how a music like this would work, I became fascinated with creating a music with as many levels of identity and kinds of recognizability as possible. Some ideas, also, are only apparently recognizable: for example, it is evident at the beginning that the trumpet ostinato is a repitative motive, but not so easy to tell where it begins or ends. I had cast the structure of a large work and sketched out a design of transformations of motives, based on a five-note motive treated with more than the usual amount of liberty, and begun to compose the piece, when I went to the Banff Center School of Fine Arts in Alberta, Canada, to work in solitude for a few weeks. When I took the bus in to Banff it was the middle of the night and I could see nothing. I well remember seeing the Canadian Rockies first thing the next morning, and thinking how spiritual they seemed to me, even more so than the American Rockies, which had already impressed me greatly when I travelled through them. The thoughts I had about those Canadian mountains would be more important to the piece than I knew at the time. The focus of the music becomes increasingly dynamic and clear until a final event that arrives like the solution of a ubiquitous, unsuspected secret cipher whose meaning suddenly dawns as it is finally understood. This realization corresponds with the confined madman Danforth’s growing awareness of the significance of the flutelike utterances he seems now to realize were some decisive truth that came from the Old Ones themselves – though by this time Danforth refuses to speak about what he seems to have realized. The music begins to indicate that the five-point star found everywhere in the City of the Old Ones has some secret correspondence with the alien-sounding word reported by Arthur Gordon Pym, and which Danforth says he may have heard among the strange Antarctic flutings in the apparently long-dead city. Or were they the flutings which Lake, from his brief study of their anatomy, which was cut short so violently, believed might have been the natural voice of the Old Ones? The design of the five-pointed star had appeared everywhere in all manner of variations in the ancient city. After the five-note musical motive appears throughout the orchestra in hundreds of forms, from single, flitting variants to vast, complex patterns, it becomes clear that the figure’s passage through varieties of expansion and diminution will reach an inevitable conclusion. At the end, it is compressed into a stark, obsessively repeated two-note figure. The impression is of a final, unrelenting and dramatic confrontation. In spite of its many variants the final figure is a surprise, but once achieved it is maintained to the end, as a simple, persistent revealed truth finally deciphered from vast, awesome expanses of rugged logic and elusive mystery. The “truth” once reached is not relented; the point of the adventure is made: it is a single word of profound realization, and of warning; and with that the piece concludes. The entire string section repeats the motive with a unanimity of insistence previously unknown to them, while the patterns of clangorous cascades reach their last echoing waves, the destinations of their mountains of invention having at last been found. The trumpet ostinato at the beginning is distilled and explained into the final two-note figure. The nomenclature of this work is: Two Flutes (both doubling piccolo); Two Oboes; Clarinets in Eb and Bb; Bass Clarinet in Bb; Bassoon; Contrabassoon; Four horns; Three Trumpets (four may be used); Two Trombones; Tuba, Three percussionists playing Glockenspiel, Vibraphone, Crotales, Chimes, and Marimba; Celesta; Piano; Two Harps; Mandolin; Strings at least Violins: 10-8-8; Violas 8, Violoncellos 8; 6. However, up to four each in each string section would be better. The total size of the orchestra required is thus between 74 and 98 players. The Dyer Expedition, also called the Misketonic Expedition, sails from Boston Harbor under Professor William Dyer with a team of 36 men and 55 dogs, aboard the sailing ships Misketonic and Arkham. Along with the scientific leaders is one Danforth, a scholar of an earlier Antarctic expedition reported by Arthur Gordon Pym, and published by Edgar Allan Poe. This knowledge proves intriguing and perhaps useful later on, when it is discovered that Poe’s Pym told the truth. October 20 Crossing of the Antarctic Circle. October 26 “Land Blink” atmospheric glow appears in the south. November 7 The expedition passes Franklin Island. November 9 Midnight: Landing on Ross Island. 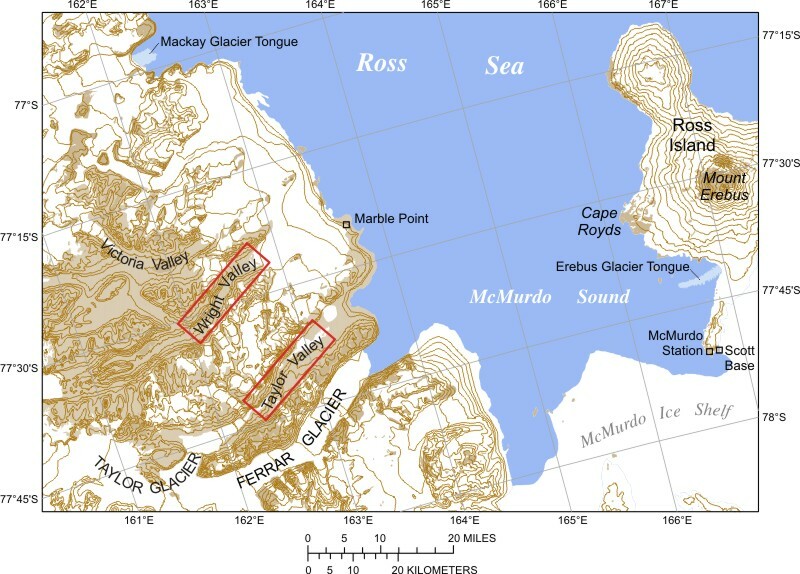 The ships remain at McMurdo Sound. and the extinct volcanoes Mt. Terror, Mt. Bird, and Mt. November 21 Four-hour exploratory flight over shelf ice. “above the glacier” at Latitude 86? 7’ East Longitude 174? north - that is, slightly less absolute South - of Mount A. 46? 36’ S 168? 20’ E.
January 11-18, 1931 Core-boring expedition of Lake, Pabodie, and five others. 6 am Lake reports in. specimens, which he doesn’t yet describe. main base.“Probable Latitude 76? 15’ [S], Longitude 113? 10’ E.
(This is almost directly south of Perth, Australia. Circe or Dome Charlie, is part. range of Antarctic points due South of Perth. 10:30 pm Lake reports Mouton’s plane forced down. The mountain is over 35,000 feet, “Everest out of the running.” Sighting of strange cube formations on mountain. Mouton’s plane is quickly recovered. 11 pm Lake scouts foothills in Carroll’s plane. He flies as high as 21,500,’ and says the mountain is 30,000 to 35,000’. (This contradicts the claim that the highest mountain in Antarctica is the Vinson Massif, 16,000 feet tall. At 13,000 feet Dome Argus is the tallest peak in East Antarctica. However, since even the Vinson Massif was not seen for the first time until 1958, perhaps there is some plausibility to Professor Dyer’s claim that there are taller mountains as yet unreported.) During a thirty-minute radio report Lake makes a direct comparison of block-like structures to Roerich’s Himalayan paintings. 4 pm Extraordinary messages from Lake. 7 pm Lake strikes a cave. Discovery of five-pointed star icon. 11:30 pm Lake’s description of the Old Ones. January 24 2:30 am Lake puts tarpaulin over carcasses and retires. 4 am Lake signs off and is never heard from again. Dyer discovers that the entire Lake party has been brutally murdered, though Gedney and some of the dogs are as yet only missing. At about 4 pm Dyer reports the situation to the Arkham. that relate the very ancient history of the Old Ones. bodies of Gedney and the missing dogs. observable in the city’s artwork. reported by the earlier explorer Arthur Gordon Pym. they are passing. Dyer gets them out of there. them in, is now insane. January 27 About 1 am Dyer and Danforth return to Lake’s Base. All expedition planes fly back to the main base. Sometime a year or two later, Professor Dyer learns of the plan to send another expedition, and, in order to prevent what he believes will be an act of folly, he writes his report, calling it At the Mountains of Madness, to discourage further exploration of the City of the Old Ones. Danforth is confined to an insane asylum, and never recovers his sanity. Though he refuses to give details of what he says he saw and heard, he obsessively repeats one expression, the fluting sounds “Tekeli-li,” over and over, which he hints he heard from one of the Old Ones’ flute-like piping voices in the ancient city. The total duration of the Dyer Expedition is just under 5 ½ months, from September 1930 to February 1931. First upload of the score of AT THE MOUNTAINS OF MADNESS was on January 11, 2013.